We’re back! 😉 Oh my goodness! It has been waaaay too long since we’ve shared a post with you guys. Things over at the Richardson house have been a little crazy, but we are happy to be back and have some exciting projects in store for 2019. 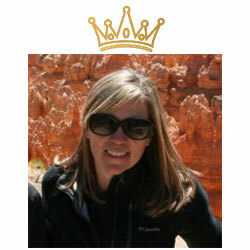 I’ve got quite a few gorgeous reader makeovers to share with you all as well, so stay tuned for those. 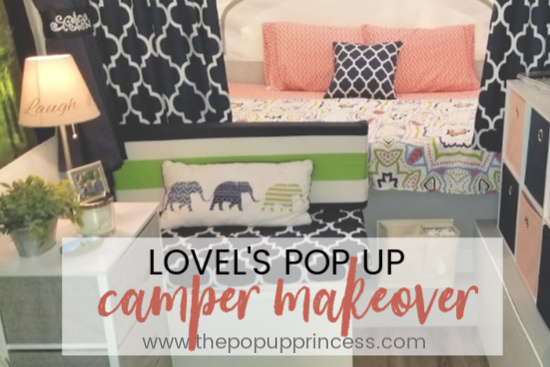 To kick off the new year, I’m sharing an adorable little camper makeover from a reader named Lovel and her husband. Lovel also came up with some creative storage solutions that I know you’ll love. Lovel and her husband owned a boat for years and enjoyed spending time outdoors on the lake. They decided to sell the boat, but after a year passed, they realized just how much they missed the outdoors. One day, Lovel mentioned the idea of getting a camper of some sort, but her husband didn’t really seem to be interested. Little did she know, he had already started doing research and was looking for a pop up they could pull behind Lovel’s SUV. 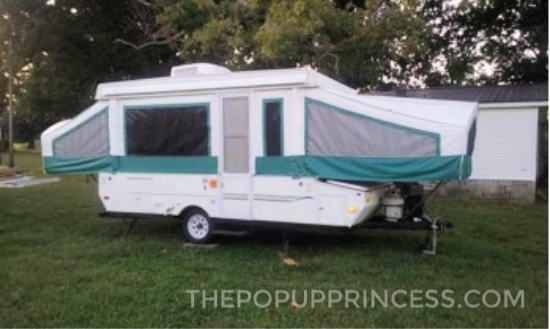 It wasn’t long before he found a 2004 Viking pop up that was in good condition but needed a little TLC. They drove a few hours to see it and ended up purchasing it on the spot. 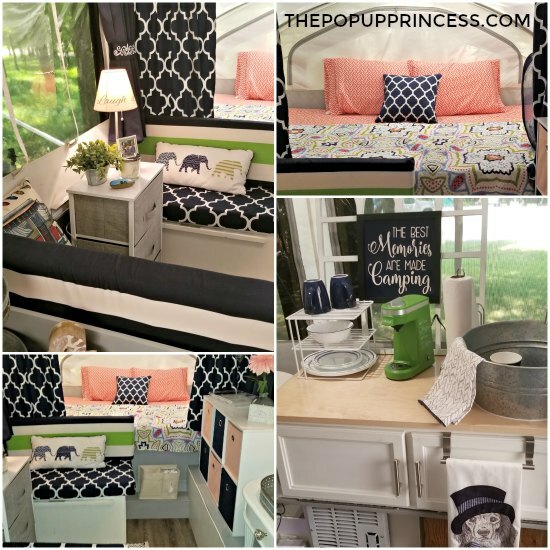 Lovel joined several pop up camper groups on Facebook and found some great ideas on how to “glamp” up her camper. 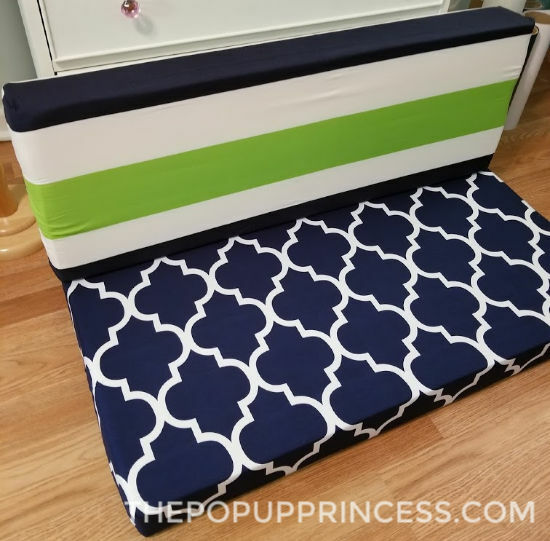 She also found all the amazing makeovers on this blog and decided she wanted to start making some changes so her little PUP would feel more like a home away from home. 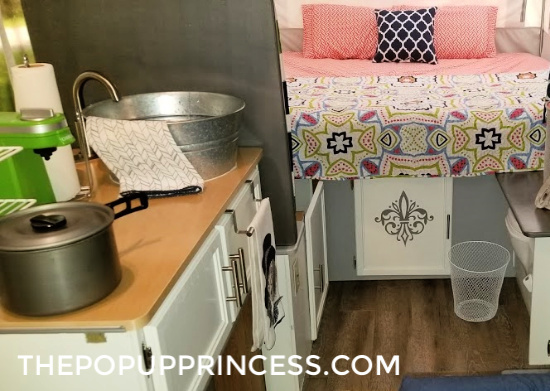 Before they made any changes, though, they took the camper out on a few trips to see how they actually fit into the camper and what they might want to change. This is such a smart idea! Armed with a new list of wants and needs, Lovel’s mind went to work. 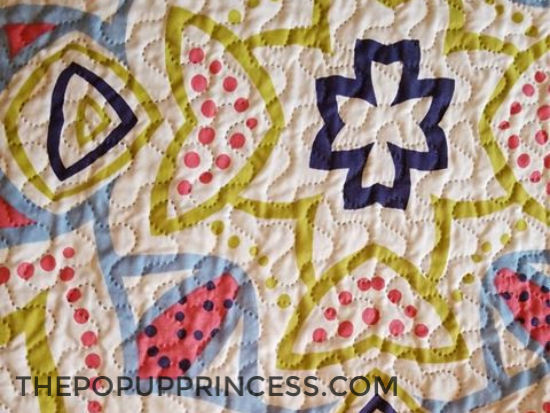 Her color inspiration came from a quilt she found on Zulily. It was on sale for $20, so she purchased two–one for each bunkend. Then she started to pull out the colors from the quilt–navy, lime green and coral–for curtains, cushion covers, and accessories. With the color palette decided, Lovel moved on to the painting. When it was time to paint, Lovel removed all the doors, countertops, and hardware. She started with two coats of Zinsser Primer on everything–including the walls–then she followed up with three coats of Sherwin Williams Alabaster. Lovel wasn’t a fan of the greenish Formica on the countertops, so she gave them a coat of primer and painted them with two coats of Hammered Steel Rustoleum spray paint. She reports back that it has held up very nicely. Lovel and her husband replaced all of the hardware with some very inexpensive hardware from Home Depot to complete the new look. 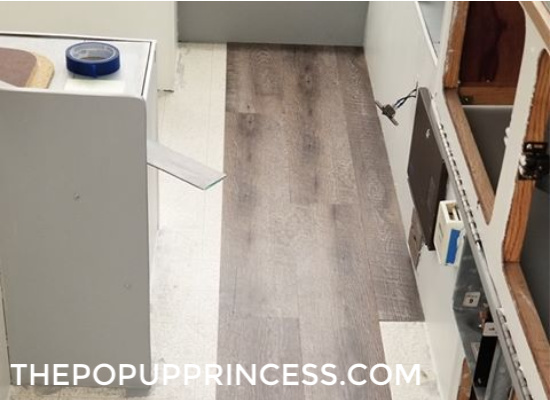 For an easy flooring update, Lovel installed adhesive vinyl planks over the existing linoleum. She cleaned old flooring really well before installing the new vinyl, which she found on clearance at Home Depot. Score! With the paint and flooring out of the way, Lovel got to work on all the fabrics. She is an experienced seamstress, so she purchased some inexpensive navy curtains on Amazon to replace the old curtains. She removed the curtain tabs from the existing curtains and sewed them onto the new curtains. They had to be shortened in length, but Lovel said they worked out really well. For the bunkend curtains, she purchased two navy trellis patterned king size sheets. There was enough fabric leftover fabric from the sheets to not only finish the curtains but also cover the bottom seat cushions as well. The covers on the cushions have an opening on the back that closes with snaps, so they can easily be removed and washed. Lovel purchased a striped shower curtain and two matching crib sheets on Amazon. She used the crib sheets to cover the cushion backs and hung the new matching shower curtain in the shower. In their maiden voyage, they realized the shower was much too small to be used for its intended purpose. Lovel and her husband preferred to shower at the campground facilities. They decided to use the shower area as a place to get ready in the morning. 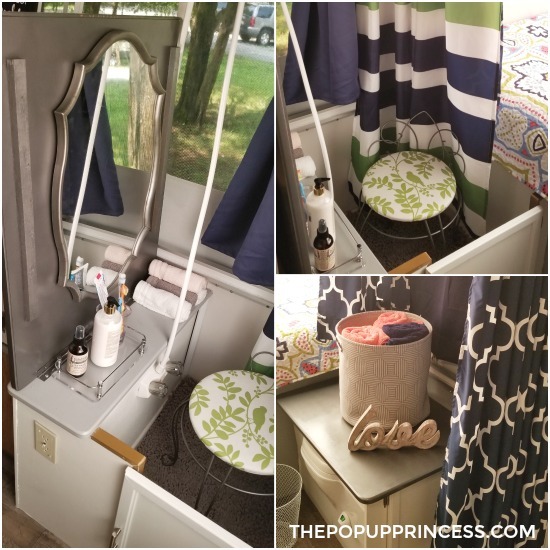 Lovel put down a rug, added a small vanity stool, and hung a mirror. She also has an area for toiletries and wash cloths. What a genius idea, right? Lovel and her husband eat outside unless it’s raining, so to give themselves a little extra room, they moved the dining table outside to hold all their cooking supplies. That opened up the space in the between the dining benches, so Lovel added a small chest with three drawers (purchased on Amazon) to hold their clothes and toiletries. If it ever becomes necessary to eat inside, they have a folding tv tray available to set up between the seats, but Lovel really likes having the extra room for storage space. She and her husband also realized there was no great need for the long upholstered bench across from the dining area. What they really needed was more storage space. She removed the cushions and set a small storage cube from Target on top. Now she stores food and paper goods in each basket. She also had enough room to set up a small “bar” she made from a garage sale table. Because she was conscious of weight issues, Lovel is still able to pull the camper with her SUV with no problems. 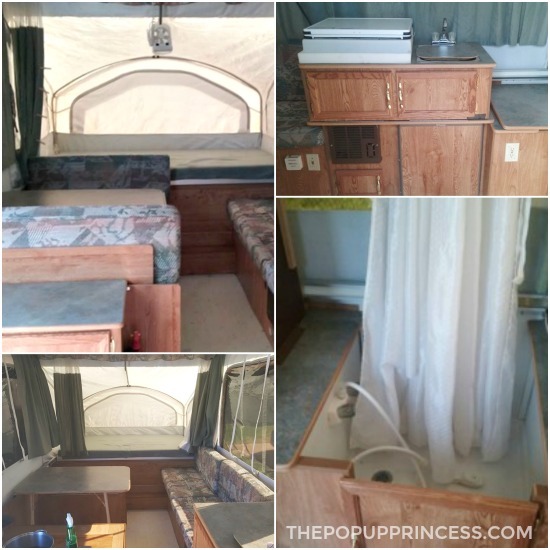 It was also important that everything she added to the pop up camper remain inside the camper after it was broken down. 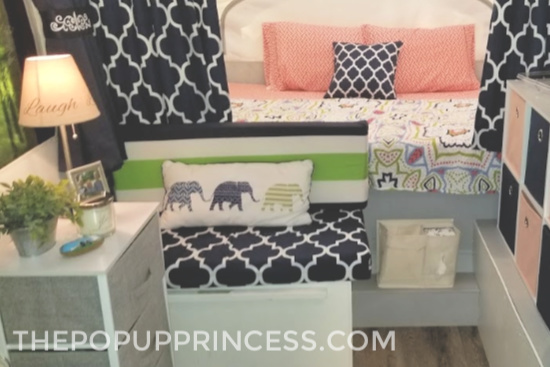 She precisely measured every piece of furniture to make sure it would all lie down on the floor and nothing would have to be taken out between camping trips. Everthing fits perfectly, and it is the perfect little set up for Lovel and her family. If sprucing up your camper is on your New Year’s project list, don’t forget to check out our awesome Reader Features. There are so many inspiring makeovers in our archives. You are sure to find the inspiration you are looking for. Thanks for hanging with us in 2018. We are super excited to see what 2019 brings us, and we look forward to seeing all your awesome campers. Keep sharing them with us! Oh my goodness! I love this so much! I have a 2001 Viking without a shower and have been trying to figure out the best way to decorate it. 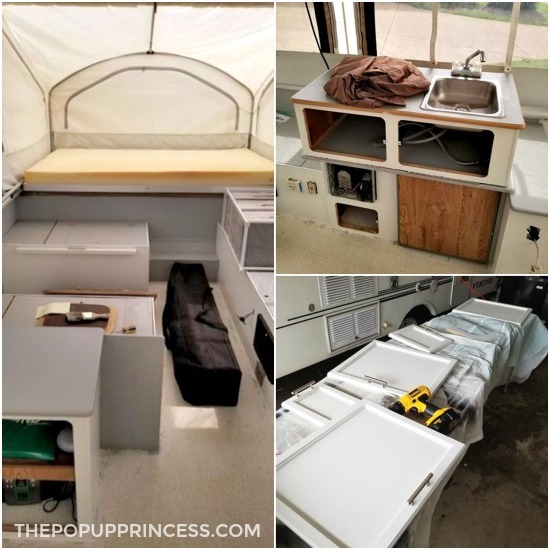 I love the additional storage, the sink, removing the table, and everything else. Such creativity! Plus, the elephants! I like the idea of picking out comforters and going with the colors around them. I haven’t been able to chose a color scheme so I think I will look for comforters. My husband and I have been using sleeping bags. Since I have a similar model of trailer I have to ask, what type of paint did you use on the cabinets? Also I have a general question for anyone to answer: What do the folks who do these remodels do to keep everything looking right with dogs? I have a Lab and German Shepherd who love to jump on the full size bunk and curl up in blankets. I am afraid they will get a nice comforter too dirty. I thinking I will need to choose a comforter which doesn’t show too much dirt and is easily washed. Love the fabric and colors. Neat set up with the dining area and sink too. Really cute! Glad to see another makeover! Pretty! I have been looking at some fabric with elephants. You did a great job! I love the new sink. Brilliant idea. I completely want to steal it. But doesn’t it sit up too high when you break the camper down?